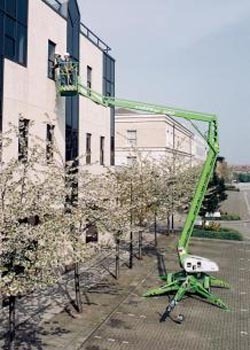 The Nifty 140 cherry picker is the first of a new generation of Nifty trailer mounts taking advantage of developments in design and build technology. It delivers outstanding reach performance without compromising on functionality or quality. With one of the largest platforms in its class and a 150° fly boom, positioning the Nifty 140 cherry picker is easy and hydraulic outriggers make setting up quicker than ever before. The Bi-Energy power option improves utilisation for the Nifty 140 cherry picker by allowing operation in discreet and fume free environments or for extended periods where no external power source is available. Hydraulic outriggers allow quick and easy setup and the audible alarm ensures that the operator is aware of an incorrect setup, when working in the busiest of environments.